Life consists largely of selection—choosing one alternative over another. Those things we choose are our priorities. Deciding “I’ll read the Bible and pray when I can find the time” is like saying “I’ll give to God’s work when I can find the money.” There are an infinite number of things on which both time and money can be spent. Without a careful plan and self-discipline, expenditures always rise to meet income. Living beyond your means of time—trying to spend time that you don’t have—is courting disaster. The hardest lesson we learned in our first twenty years of marriage was this: life is full of good, worthwhile, and meaningful programs, activities, organizations, causes, and ministry opportunities—the vast majority of which we cannot and should not be involved with! It is not sufficient that something be good or important. It must be the best and most important for me, and God must show me that. Why? For the same reason that if I have a hundred dollars to spend on groceries this month, I should buy meat and milk and fruit and vegetables, not donuts and chips. Most good things I will never be able to do. If I try, I’ll burn out and end up dropping out of half of them and doing the rest poorly. In the next two months you may be asked to host a luncheon, collect for the American Cancer Society, teach a class, lead a discussion group, work in the church nursery, be a room mother, run a booth at the carnival, serve punch at a wedding, coach soccer, be a teacher’s aide, cook for the high school group camp-out, and go on the women’s retreat. Very likely it is God’s will for you to do a few of these good things. But all of them or even most of them? No way. Consider making it a policy never to say “yes” to anything until you’ve thought and prayed about it for one week. Even if someone needs an answer today, tell them you’ll call them back no sooner than a few hours. Don’t impulsively say “Yes” or you will feel—and be—out of control. Of course, there’s also the woman or man who says “No” to everything and needs to learn to say “Yes.” Be sure you say “Yes” enough to get your exercise, and “no” enough to get your rest. Steward your life so that when it’s something you sense God’s prompting to do, you will have said no often enough to give you room to say yes to those relatively few things God wants you to do. 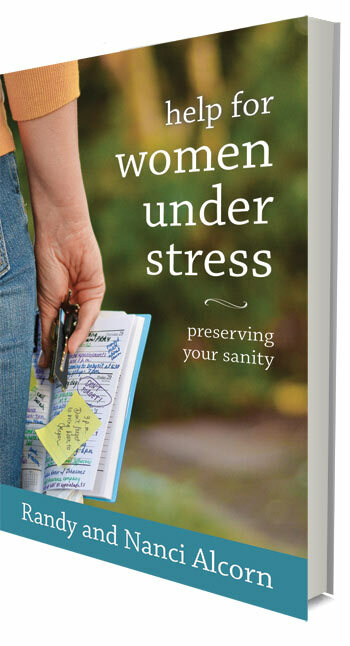 Excerpted from Randy and Nanci Alcorn's book Help for Women Under Stress. Revive Our Hearts, a great ministry that my daughters and a number of our ministry staff have benefited from, recently posted a link on Facebook to this two-minute video about finding time to read your Bible.